Bottle conditioned: 275ml. Has occasionally appeared on cask. 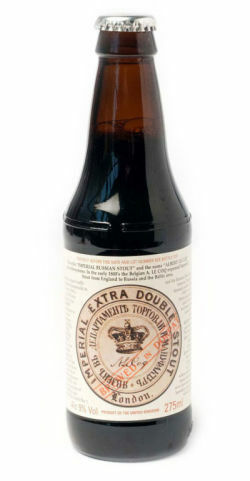 Imperial Extra Double Stout is regarded as one of the World’s most unusual and prestigious beers. The recipe contains a dense concentration of varied malts and hops to produce a bottle conditioned stout of 9.0% ABV. This brew will improve and develop complexity up to one year and has an intense flavour which is distinctive. The roast, alcoholic and spicy notes combine in this unusually sweet & sour beer. UPDATED: DEC 15, 2018 A bottle in Harvey's tap room in Borough. Pours black with a thick beige head. A prominent port and roasted barley aroma leads to a heavy wine and alcoholic taste. Dark fruits and grains are also present. the beer was served at room temperature which was a couple of degrees above the ultimate temperature for my taste. Still a classic beer from a great brewery. [email protected]Ølfestival København 2018 - black pour with a tan head. Dark and sweet malty with rich chocolate, toffee and caramel sweetness, earthy burnt charred malty notes, medium to full body, dark malty finish. UPDATED: MAR 9, 2019 From a beer hawk case mystery case. Pours black and flat, little aroma , liqourice , malt , hops , very sweet. Ok in small doses , but an awesome Russian stout brewed in the uk, under supervision of Estonia! UPDATED: SEP 18, 2018 Bottle from K&L in Redwood City, CA. Aroma is licorice, old coffee, mild smoked wood and roast malts. Taste is tangy licorice, sweet, tannic dark fruit and then chalky ash. This tastes like something historic, which isn’t particularly incredible but it’s definitely unique and worth trying. UPDATED: AUG 11, 2018 Bottle. Black with a medium sized light brown head with good retention, lace and regeneration. Roasty and wooden, light charcoal, iron, earthy. Medium body, mild sweet, medium bitter and mildly acidic. Roasted and acidic finish. DØE. Black with small beige head. Aroma is roasted malt, chocolate, coffee, liquorice and a little salt liquorice . Flavour is roasted malt, chocolate, coffee, liquorice, salt liquorice, warming, sweet and bitter. Had this a while ago, may have been my first IPS. I remember it being very tart, and the taste was off somehow. Was one of those beers that stood in my mind not to buy again, especially for the price. Not really that bad of a beer, just unique for it's style. $6.49 bottle, Wine Warehouse. Not sure of the bottling date - on the cap there a 20 (blank) 3. 2013? or is this just a wild goose chase? Pours thick and black, no head at all. Lovely sweet aroma: chocolate, dark cherry, vanilla, caramel. Flavor is chocolate - somewhat sweet, followed by woody cherry, vanilla, earth, prune, a hint of coffee at the end. Lots of flavor, all good. Almost no carbonation, which for this beer is just fine. Oily. Yum.